At Glow Med Spa, we believe that everyone should have glowing, gorgeous skin. 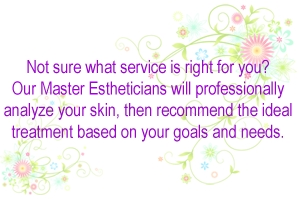 Whether you’ve been receiving facials for years or considering one for the first time, our Master Estheticians will professionally analyze your skin and recommend the ideal treatment based on your goals and needs. From gentle starter facials to more intense microdermabrasion or chemical peel treatments, we have the facial service you need to have glowing amazing skin! And don’t forget to check out our service add-ons to enhance any facial treatment. **Glow recommends the Deep Pore Glow Facial for all first time clients, as it gives our Master Estheticians the most time to get to know you and your skin goals. A very relaxing facial especially formulated for you using a custom blend of treatments to help firm, hydrate, correct and clarify the skin. You will leave with increased circulation to the face that helps restore skin’s optimum texture, look and feel. Immediately targets the skin’s tone, elasticity and volume as it reverses fine lines and wrinkles. Skin is transformed by pressurizing atomized moisturizers, anti-oxidants and vitamins. This process makes the face instantly smoother, tighter and more plump. Look your best for that special event!